In Japan there was a clear recognition of the potential importance of rockets, but relatively little that the Japanese scientists could do about it. Japan is a nation that lacks natural resources, and at the time had limited industrial experience. Like many centralized states, it had a cumbersome bureaucracy and a tendency for rival organizations to seek to outdo each other. In the early years of World War II, both the Imperial Japanese Army and Navy were looking at developing 8in (20cm) rockets. The Army’s 8in rocket was a spin-stabilized projectile equipped with six vents to impart both spin and propulsion. It was designed to be launched from a Type 4 Rocket Launcher, in reality a mortar. By contrast, the Japanese Navy developed their own rival version. Their 8in rocket was designed to be launched from simple wooden troughs or even from holes in the ground. The Japanese also developed the Type 10 Rocket Motor which was a simple propulsion unit intended as a launch facility for aerial bombs. They later produced a rocket 18in (44.7cm) in diameter; it was an unsophisticated projectile that was used in action on Iwo Jima and had a maximum range of over a mile (2,000m). Although it was inaccurate, it delivered a warhead of 400lb (180kg). Interestingly, this rocket was also spin-stabilized. This rotation around the axis had the potential to stabilize a rocket in flight, just as the Congreve rocket had in a previous century. The Imperial Japanese Army focused their efforts on developing an air-to-surface missile while the Navy concentrated on the design of surface-to-air missiles. The Army decided to develop their Igo missile, while the Navy’s project was the Funryu (Raging Dragon) rocket. The Igo-1-A was a winged cruise missile constructed by Mitsubishi from wood and metal. It was 16ft (5.77m) long, and had a wingspan of 10ft 9in (3.6m). It had a launch weight of 3,080lb (1,400kg) and could deliver a 1,760lb (800kg) warhead at a velocity of 340mph (550km/h). The rocket motor was a Mitsubishi Tokuro-1 Type 3 which fired for just 75 seconds. There was also an Igo-1-B produced by Kawasaki which was of similar design but delivered a somewhat smaller payload. Both versions of the Igo-1 were launched from an aircraft at about 5,000ft (1,500m) some 6 miles (about 10km) from the target. An onboard altimeter established the missile on a straight and level path and it was then radio-controlled by the pilot to the target. The missiles left no smoke trail and it was difficult for the aircraft pilot to aim them accurately. The rockets were fitted with a tail light for use at night – but under these conditions, although the pilots could see the drone, they now had difficulty in seeing the target. The final refinement of the Igo rocket was the Igo-1-C, developed by the Aeronautical Research Institute of Tokyo Imperial University. Rather than being guided by radio, the Igo-1-C was ingeniously designed to home in on the shockwaves produced by ships when they fired their guns. Meanwhile the Navy were developing their Funryu rockets, and planned to produce four versions. Like their Igo counterparts, they would be radio-controlled to the target. In the event, only the Igo-1-A and Igo-1-B went into production, and none was ever fired at the enemy. 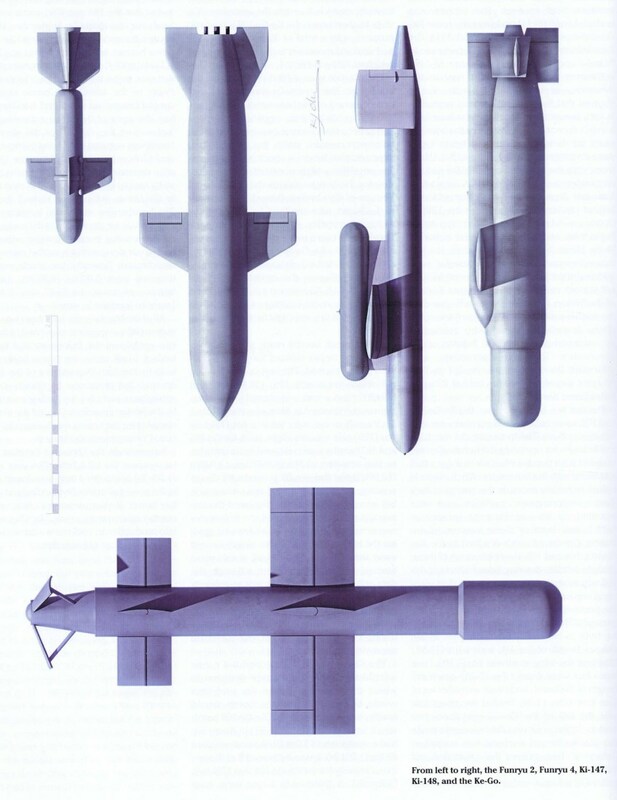 Air-to-ground missiles were not seriously considered by the Japanese until March 1944. The Army continued to prefer spin-stabilized rockets, while the Navy wanted devices stabilized by fins. Had the two services combined forces, an optimized design could well have been agreed but, as it was, the age-old rivalry persisted and each service pressed ahead with their own ideas. The air-to-ground missiles were to be fitted to the Kawanishi N1K-J Shiden (Violet Lightning) aircraft which were to be specially modified to carry six of the rockets ready to attack the fleet of ships that the Japanese believed to be on its way to invade the homeland. In the event, the aircraft never achieved full operational status before the war’s dramatic end. Japanese plans to fire off a salvo of rockets were never achieved; instead each rocket was launched singly, in the manner of firing off a mortar, and so little useful benefit was ever achieved. This entry was posted in Japan, Weapons by MSW. Bookmark the permalink.